ErtelAlsop offers the widest variety of high quality specialty filter paper available. From laboratory to full-scale production, we can supply the best product for your liquid filtration application. For many years filter paper has been widely accepted as one of the most versatile filter media available. Due to a basic formulation of cellulose fibers with or without wet strength resins, it is highly compatible and can be used for a wide range of applications. 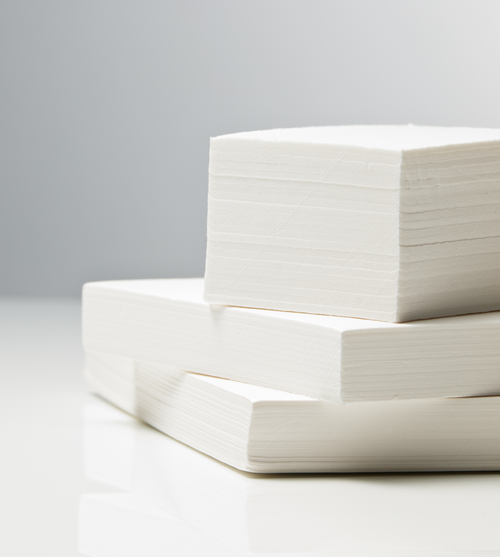 Filter paper provides a more economical solution for those applications requiring low solids retention or cake building properties. ErtelAlsop also offers a Pharmaceutical Grade Filter Paper, specifically for use in critical applications where lot to lot traceability is required. Our P-Grade Filter Paper is composed of cellulose pulp with all virgin raw materials, RO water, and the option of wet strength resin. Each batch is lot numbered allowing for lot to lot traceability and batch to batch quality assurance. When compared to standard grades of filter paper, our Micro-Media® Pharmaceutical Grade Filter Paper provides superior quality, lower extractable levels and greater consistency. Filter Paper is also used in the food and beverage, chemical, and pharmaceutical industries . Filter paper is used for clarifying liquids or as a septum to hold cakes of diatomaceous earth, activated carbon, perlite, powdered cellulose and other filter aids in plate and frame filter presses, horizontal plate filters, and Nutsch filters. ErtelAlsop can provide the best combination of filtration equipment and filter media to meet your specific needs, whether it is filter pads or filter paper. Retention ranges from 1 micron to 100 microns. 9000 Series: Bleached, creped surface, 100% cellulose.